Bank services are affected in the National Capital Region (NCR) on Tuesday due to All-India Bank strike on 22 August 2017 of bank personnel against the proposed government policies to improve banking sector. 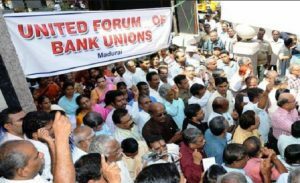 An official of the United Forum of Bank Unions (UFBU), the organization of nine bank associations calling for a strike, said that more than 10 lakh bank employees employed in 1,30,000 branches of the country are involved in the strike, due to which the work of check clearing has influenced. UFBU is opposing reforms in the banking sector and other issues. The strike happened after the negotiations failed on Friday between the UFBU and the Indian Banks Association, the Chief Labor Commissioner, and the Financial Services Department (FSD) on Friday. AIBEA said in a statement issued on Tuesday that key demands in 17-Point Demands relate to refusing to provide adequate capital to the public sector banks, thereby creating a situation of privatization.